In 1865 New York City would begin to return to normalcy as its citizens began putting back the pieces of lives shattered by four years of war. The Third Avenue area above 34th Street sat several blocks from the elegant residential neighborhoods to the east, and its streets rang with the accents of Italy, Ireland and Germany. At the southeast corner of Third Avenue and 37th Street stood a recently-completed hotel. Just 24 feet wide—the width of a commodious private home—it stretched back along 37th Street to encompass two more plots. Its attractive design included none of the marble embellishments found in the lush hotels on Broadway at the time. Instead brownstone sills and lintels graced the openings and the ingenious and somewhat complex cornice was executed entirely in brick. And despite its working class environment, it boasted a stylish slate-shingled mansard roof. The ground floor was given over to retail space—one on Third Avenue and another on the far side of the hotel’s entrance at No. 202 East 37th Street. George Steul operated his oyster house in the Third Avenue space in 1865. Sometimes called “oyster saloons,” establishments like Steul’s were highly popular with hard-working laborers. Oysters were a cheap food served with the ales and liquors. To the rear of the building at the time was Dr. John R. Cypert’s pharmacy. Cypert, who graduated from the University of Nashville in 1858, lived nearby at No. 167 East 39th Street. Later he would focus more on his medical practice and open an office at No. 656 Lexington Avenue. For a period George Steul’s saloon saw a turnover in owners. By 1870 John G. Gerdes ran it. He lived a few blocks away at No. 900 East 37th Street. And in 1876 Irishman Thomas Regan was the proprietor. Regan lived upstairs in the building and a year later he took John Curry into the business. Finally in 1879 the saloon found a long-term owner in John Duggan, who had arrived from Ireland around 1868. Described by the Retail Liquor Dealers’ Association as “its genial and enterprising proprietor,” Duggan would run the saloon until the turn of the century. In 1893 A Souvenir of New York’s Liquor Interests (a booklet published by the liquor association to combat prohibition), described the Third Avenue saloon. While it provided a valuable glimpse inside the barroom, it was a bit generous in describing its patronage. The lurid press coverage of an upstairs resident, Addie St. Claire, would suggest that the description of the “best class” of patrons was a bit air-brushed. Addie was what would today be termed a “madam,” but she was a much more dangerous woman than the average brothel owner. Now notorious, Addie moved to No. 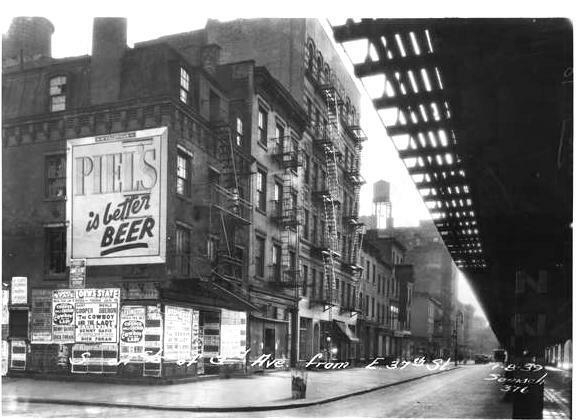 93 Third Avenue, then to West 38th Street, and then to rooms above Duggan’s saloon. When she moved into No. 202 East 37th Street, she changed her name to St. Clair. 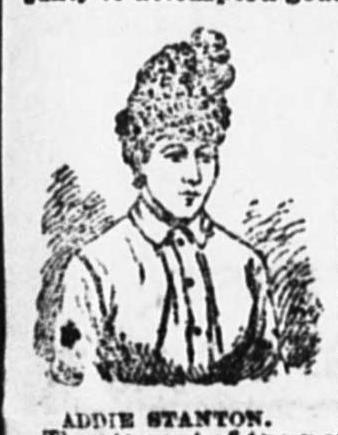 Her remarkable disregard for public opinion was reflected in the fact that she wore “the bullet which nearly ended Bishop’s life in a gold setting about her neck,” according to The Evening World. Addie’s reputation and her flagrant dealings kept her on the move. Before very long she left the Third Avenue building to West 12th Street near Eighth Avenue, where she went by the name of Nina Earl; then to No. 144 East 14th Street; then to the Hotel Dam, where she was known as Mrs. Martin Lewis. Here they executed a “panel game.” Patrons would be lured to the rooms by the women and then ambushed . Fearing scandal, the victims would not report the robberies. But the scheme came crashing down when one victim fought back on November 28, 1888. To the disgust of newspapers across the city, although the two women pleaded guilty to the crime, they were let free. The Evening World, on May 17, 1889 complained that while “Honest Phil Daly, the gambler king, is perilously near death…Addie Stanton, who lured the unfortunate man to the flat by means of a decoy letter, is free. Only one day later The Evening World ran the headline “At It Again.” A battered and bleeding man had stumbled from a tenement house at No. 386 Third Avenue, another victim of Addie and Ella. Upstairs, the tenants were on the most part respectable hard-working citizens. The same year that Addie Stanton was arrested for the assault on Phil Daly, Patrick J. Meskel was appointed to the position of clerk in the office of the Mayor’s Marshal. He also served as Vice President of the Young Men’s Democratic Association of the 18th Assembly District. In the first decades of the 20th century residents included M. O’Hara, a builder, and Myrtle A. Downing who made a bit of feminist history in September 1918. The unmarried woman was a member of the first Class of Women Conductors of the electric railway system. In 1934 the architect George Dress designed renovations to the old structure. The now-decrepit residential spaces were gutted and converted for “light manufacturing.” But just over a decade later, in 1946, the Department of Buildings deemed the building unsafe. The McBride Co., book and periodical publishers, took a 10-year lease on the entire structure. It updated and renovated the old factory floors to offices. Unfortunately for McBride Co., it declared bankruptcy in 1948, a year after the improvements were completed. It was followed in the building by two other publishers. The Public Guardian, a 16-page weekly tabloid, started publication here in 1949. The newspaper sold for 10 cents. And in 1951 Sanford M. Merhan established his new Herman Catalog Service in the building. Today, appropriately, the Third Avenue store is home to a tavern and restaurant. The old saloon front was lost years ago and the 37th Street ground floor has suffered various indignities. But overall the old hotel-saloon looks much as it did a century and a half ago when New Yorkers celebrated the end of war.